I've been passionately collecting vintage Hamilton watches for several years. Like everyone else, my interest was piqued by inheriting some family pieces where the sentimental value led to an increased interest into where these fascinating time pieces came from, and the history they have seen while on their owners' wrists or in their vest pockets. 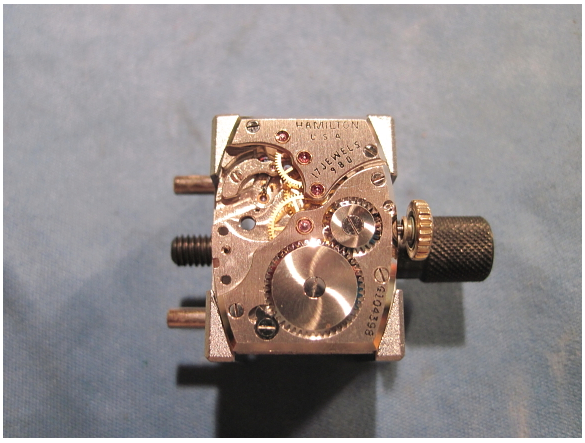 Like any machine, mechanical time pieces need to be regularly maintained in order to function properly. 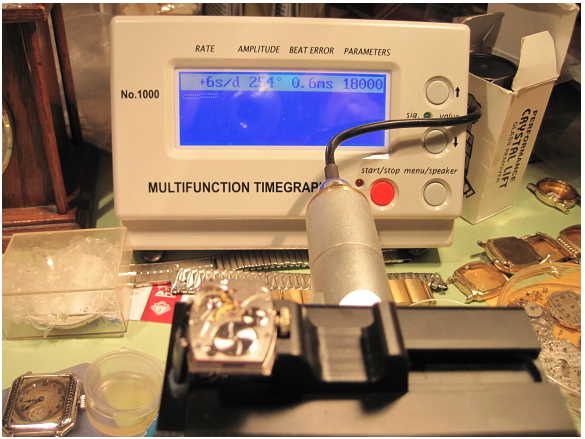 Back before watches were disposable, you would take your timepiece to a watchmaker for service. A "service" would include the complete disassembly of the watch, thorough cleaning of it's pieces and parts, replacement of anything broken or worn, application of specially formulated oils and lubes in critical places, reassembly and then any fine adjustments needed to keep time well. The typical recommendation service interval for a watch was every three to five years. Doing so would allow it to last a lifetime. So what does that look like? Let me show you. 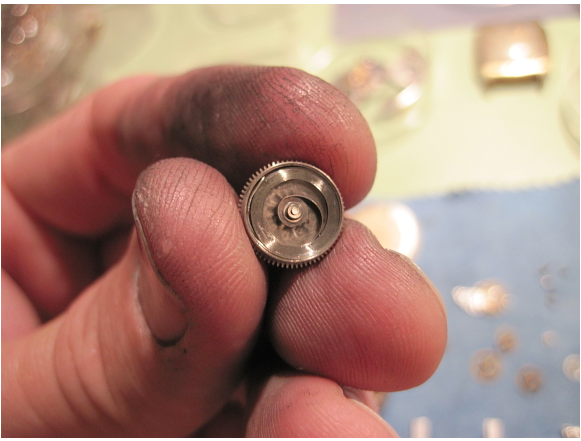 Here are some shots I took while overhauling an enamel-dialed Sutton. These aren't completely step by step detailed instruction but it's a pretty good overview the process. 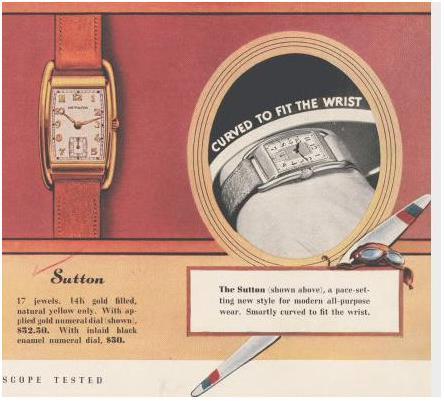 The Sutton was introduced by Hamilton in 1937 and produced through 1940. The case is 14K gold filled. 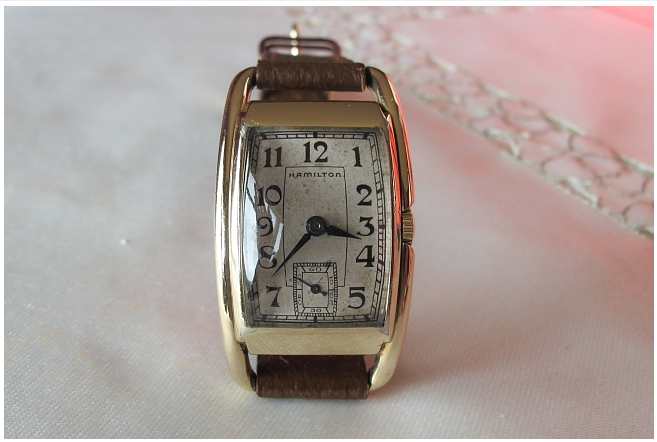 It featured a 17 jewel 980 movement until 1940, when 14K gold filled models got the 982. Dial choices included an "Applied Gold Numeral" AGN dial or an enamel dial, like shown below. This watch arrived dirty but working. 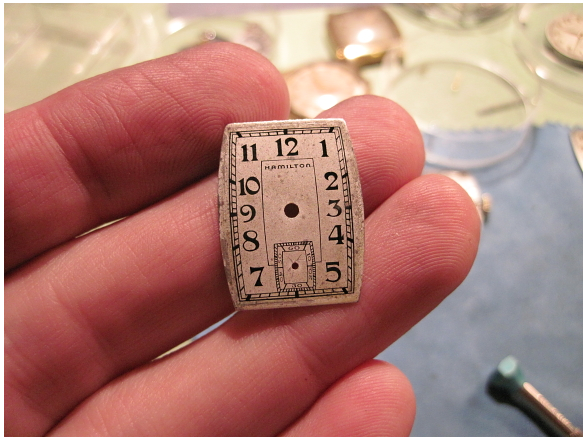 The enamel dial was very dirty and it took me a long time to get it clean (sort of). It's a lot less dark than it was but still shows it's age nicely. 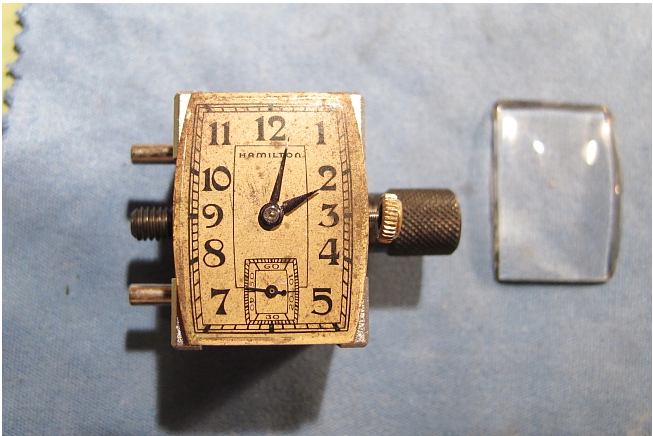 This is an original dial, I believe, as there are no markings on the back to indicate that it was redone - which was common and often part of the "service"
Once the dial is pulled and the cannon pinion is removed, it's time to take the movement completely apart. The cannon pinion is the part that the minute hand is attached to. I'll save "how a watch works" for another post. You need to remove it in order to pull the center wheel from back of the movement. 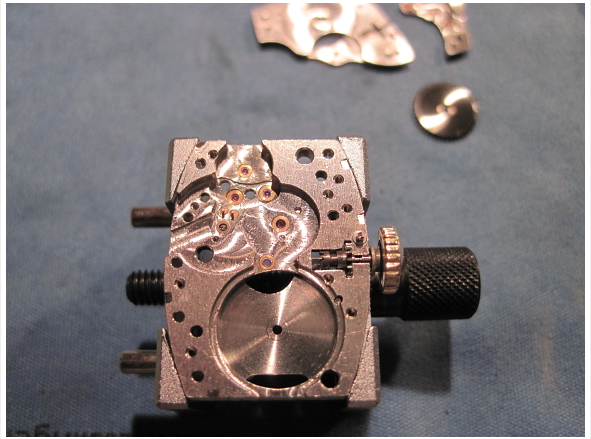 With the mainspring tension completely let off, each screw can be removed. 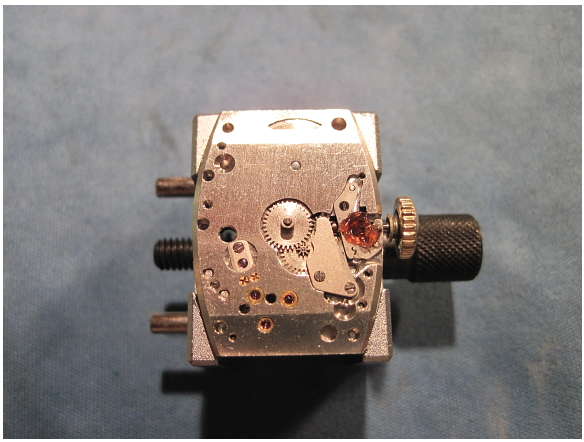 I start with the mainspring barrel and work my way through the gear train. I pull the balance assembly only after all the other wheels are removed. You can see below that once all the bits are removed there are a lot of pieces to keep track of. I've done this about 200+ times by now so I recognize everything by sight. But I started off using a pill box with numbered bins and put every piece in it's own bin in the order I removed it. Then I went in the reverse order to reassemble. A good way to learn but took a while as I cleaned everything separately back then. 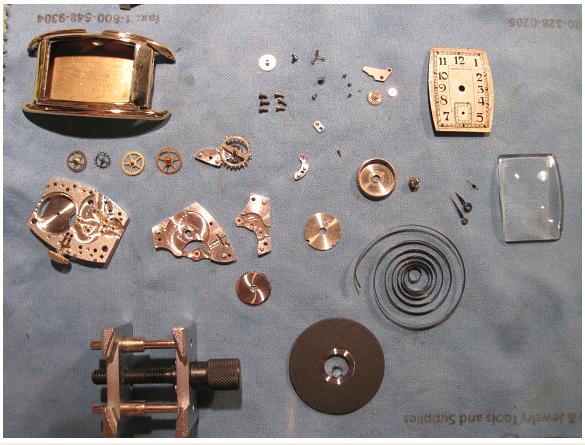 Once it's all disassembled, everything but the dial and balance goes into an ultrasonic cleaner for several baths. I treat the balance especially carefully so I don't lose the impulse pin (which has been known to happen and is never fun). 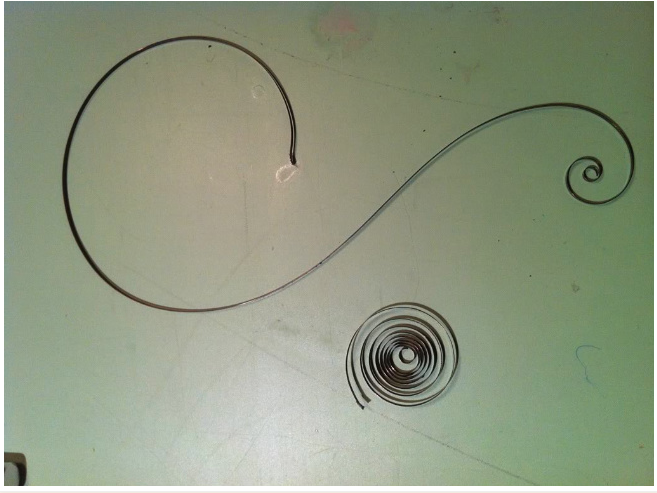 Notice how coiled the mainspring is. The replacement is next to it in the black ring. Without the black ring it would splay out and start to coil the opposite direction. There's a big difference in run time between an old and new main spring. Here the mainspring is tucked safely back into the barrel, lubed and the arbor (center) is installed. I have about four arbors somewhere in my shop... they have been known to fly off into the stratosphere when reinstalling them and I always hold my breath while inserting one. 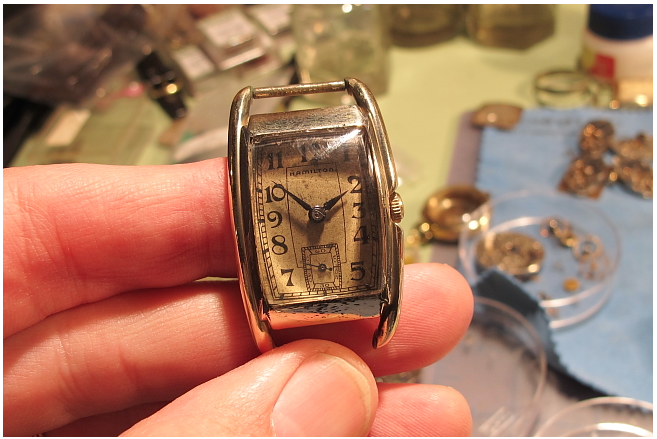 My fingers got a little dirty polishing the watch case while the rest of the watch is being cleaned and dried. With everything clean and dry it's time for oiling and assembly. The balance always goes on last - that way I don't accidentally damage it while installing the dial and parts from the front of the watch. 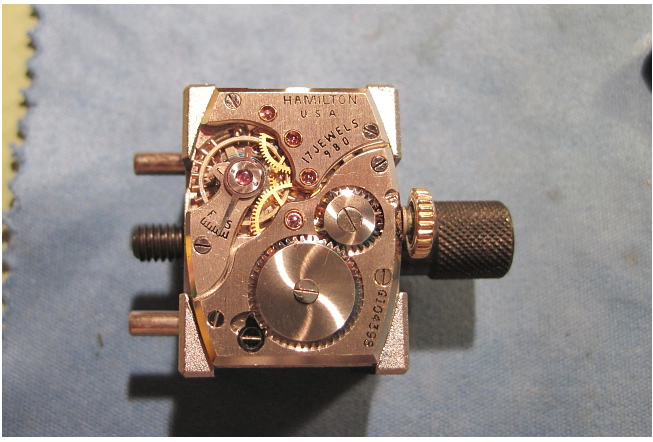 This is an early 980 movement (the Sutton came out in 1937). Note the set spring yoke is a two piece design. The red stuff is grease for the winding components. The cannon pinion and hour wheel are reinstalled. The dial goes on and then the balance and it's off to the watch timer... 6 sec/day fast... not too shabby. I try to get my watches to within 30 seconds per day. The rate will vary with mains spring tension and position but generally speaking being within that range is plenty acceptable. Pop it back into the case and it's ready for some hands. The hands are the first things off and the last things back on. You have to be very careful with the second hand - it can be easily misaligned. Snap the back into the front, add a nice Hamilton strap and we're in business. And here's a better shot. The acrylic crystal is decent but I prefer glass so I'll replace this one eventually. Feel free to leave comment or questions below. do you know if there are any escape wheels anywhere for my Sutton? Sure - just buy a donor movement from eBay. Any 980 or 982 will do. That's probably the least expensive option. Or you can web-search "watch parts supply" and call around. I have a Sutton in near perfect condition but no longer keeps time. Local repair shop told me the main spring needs replacement. I love this watch. Can you fix it or recommend someone who can? Any watchmaker can handle that task. Email me through my Etsy shop if you want a couple referrals. 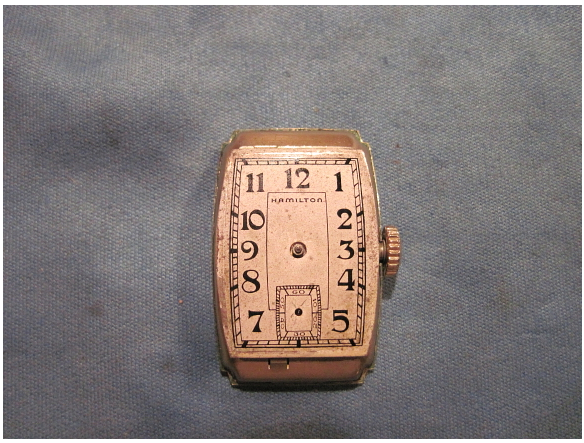 Would you be interested in buying a Hamilton Sutton in pretty good condition for its age? I would say it is probably 6.5-7/10 condition. No major scratches on the crystal, I believe it is the original album gold band, face has no corrosion and bezel is in good condition. 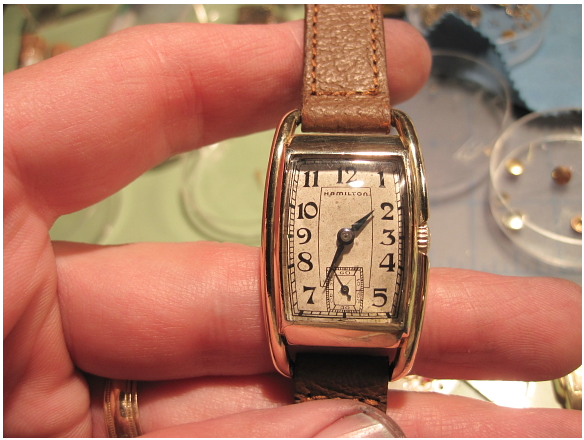 I'm not sure the exact year, but if yours is a 1940, I would guess mine is probably a 37 or 38, due to the style of the second hand, and the way the numerals are. You can tell yours has defiantly evolved from my style. I also have the original box and instructions. That are also in great condition. The hands will not move. I have tried winding it up, and it has tension, and holds tension. But will not release. The hands will move when you pull the dial out though. If you are interested please contact me. And if you are not I would still like to talk to you about help with restoring it. Like help with figuring out the problem keeping time obviously, and also things like best ways to buff the crystal, what oils are needed, if it is safe to put in the ultrasonic cleaner as is, and ways to identify the year and stuff. Thank you for your time. And your watch came out looking great. And that you for the info.